Scottrade has made a name for itself by catering to beginner traders and investors. It’s an extremely popular brokerage, particularly with people with no experience in the stock market. They have a wide variety of investment/trading options from your traditional brokerage to IRA accounts. The combined strengths of Scottrades’ award winning trading platform, Scottrade Elite, market research and low commisions make for a great place to open an account. If you have any questions about opening the account, their customer service is available almost 24/7. If you live in a major city, there is a good chance they have a local branch you can always go there in person to open it or if you just want to talk to a broker. What everyone is interested in of course is, how much does it cost to trade? Whats AWESOME about Scottrade is they charge $7 per trade, regardless of size. So this means that the higher value trades pay a lower percentage of fees: A $100 trade costs the same as a $10,000 trade! Every large broker out there charges fees ranging from $7 to $20+. Keeping this in mind, Scottrade comes in as one of the cheaper options. One area that sets itself apart from most other brokerages is the in-person availability. Scottrade has hundreds of branches across the United States that their customers can go to for investment advice, rollover help, tax assistance, legal questions and believe it or not TRADING ADVICE! This is a huge help for people looking to get a more personal touch out of a brokerage. Researching stocks with Scottrade is a breeze. They cover the all major bases, including fundamental data on insider transactions, earnings, financials, and even SEC filings from several third-party research providers. Pulling up a quote on Google (GOOGL) offers reports from three third-party providers: Standard & Poor’s, Thomson Reuters and Second Opinion. Navigating the research area, just like the rest of the Scottrade website, was simple and straightforward. 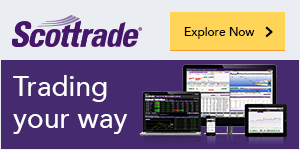 Not only does Scottrade have a quick quote box on the top header, but it also has one on the left sidebar and footer bar. You can even place trades from any page of the website. Whether you are pulling up a quote or looking at a stock chart then reading an analyst report you will have no trouble navigating your way around. One feature that is pretty slick and exclusive to Scottrade clients, is the Scottrade SmartText functionality. The SmartText analysis is available for charts, sectors and industries, and earnings. With charts as an example, it will quickly analyze any indicator you add and give you an easy-to-understand explanation of what that indicator implies for the stock you are researching. Scottrade has won Best Overall Client Experience from 2012-2015 for all discount brokerages and offers the most personalized customer service out. Considering the competition is fierce in this area this is very impressive. Scottrade is the only online broker that leans on its local branch office network. If you call the support phone number during market hours it will prompt you for your zip code, then redirects you automatically to your local branch office. Within a few rings you will be speaking with a rep from your local branch office. They are experts in answering questions regarding new accounts and using the website or the Scottrade Elite trading platform. Scottrade’s network has 503 local branch offices within the United States, and all operate during standard market hours: 8:30 a.m. to 5 p.m. Monday through Friday. Over 500+ locations throughout the country. Free real-time streaming quotes and charts for non-professionals. No account set up, maintenance or inactivity fees. Free online banking through Scottrade Bank. Free online educational resources and free live investment workshops. Low costs: Scottrade’s $7 stock and ETF trade commissions put it between fellow full-service brokers like TD Ameritrade and E-trade and discount brokers like OptionsHouse and TradeKing. Scottrade also offers a large selection of commission-free mutual funds, but does not have commission-free ETFs. Scottrade also has no inactivity or annual account service charges plus very competitive mutual fund trading fees of $17. Customer service: This is where Scottrade really excels. They are consistently given high rankings for customer service partly due to its 500-branch network, which is the largest of all online brokerages. Customers can speak to an investment advisor in person and attend local investor-education events. Scottrade also has an extensive online education center, with live webinars, videos and articles. Trade platforms and tools: Scottrade’s trading platform, ScottradeELITE, is unfortunately only available only to customers that have an account balance of at least $25,000. The desktop platform was designed for active traders and revamped in 2014 with much stronger functionality and a better user experience. Other customers can place trades through Scottrade’s online trading platform which has no balance or trade requirements. It offers plenty of features as a trading platform, including customization, advanced charting with 30 technical indicators, watch lists and, of course, streaming quotes and live news updates. Mobile apps: Scottrade’s has a mobile app that is well-designed and fairly advanced, allowing customers to place trades, monitor market performance with watch lists and access research. The mobile apps is available for iPhone, iPad and Android. Account minimum: Scottrade doesn’t have a minimum for IRA accounts, which makes it ideal for beginner investors. Brokerage do require a $2,500 minimum investment. While Scottrade may be suitable for the very beginning of investor, anyone who trades AT ALL would be much better off with Optionshouse, who I am using now. Click here to read my review.